Photos and posts about dolls I collect. What a silly question, right? Of course, I knit another, and another. And even in doll-size. 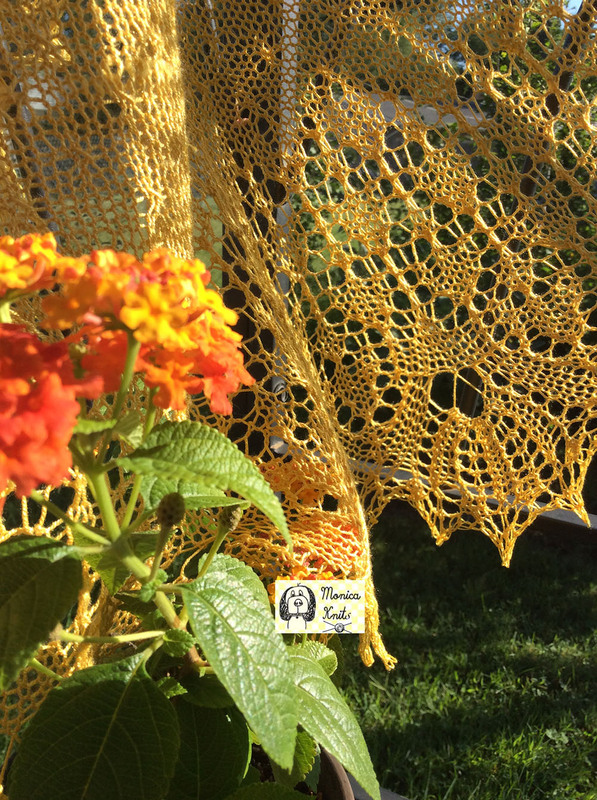 I love Alina Apposov’s Lale Lace Shawl. I call this one “Sunshine and Tulips.” I think I will keep this one. I love the detail in this. 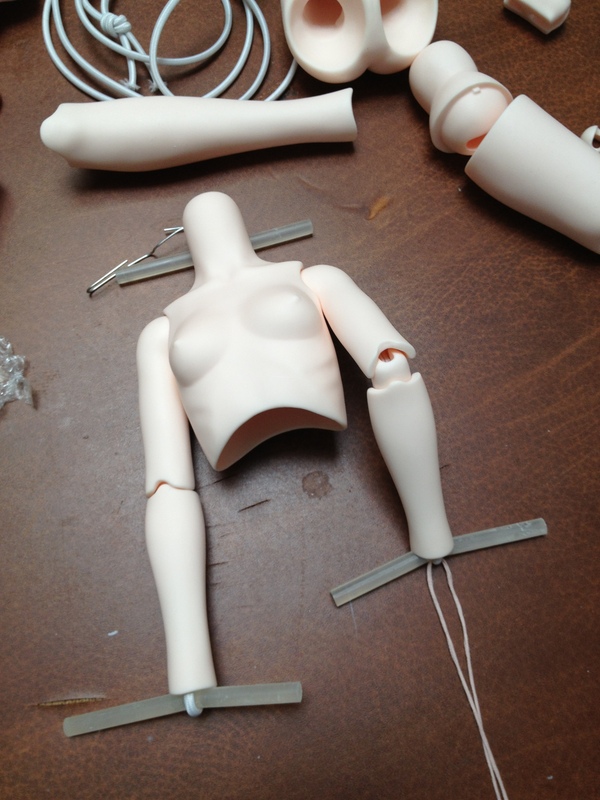 In my last post, I shared with you my adventures in assembling a 57 cm BJD. She now has a head, eyes and her hands. 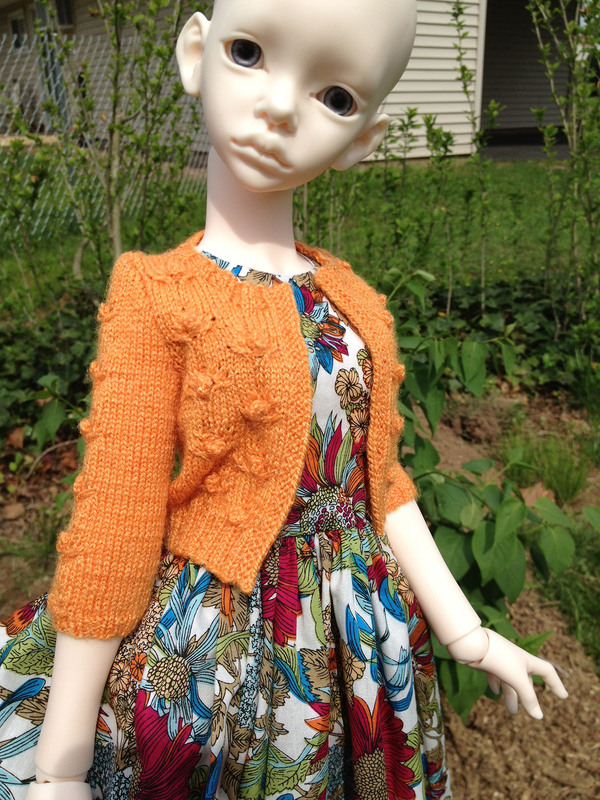 However, she is still without hair and a face-up. But I think she is beautiful in the bald, just the same. I think her name is Phoebe. Her dress was made by a lovely lady in the UK. It fits Phoebe perfectly. 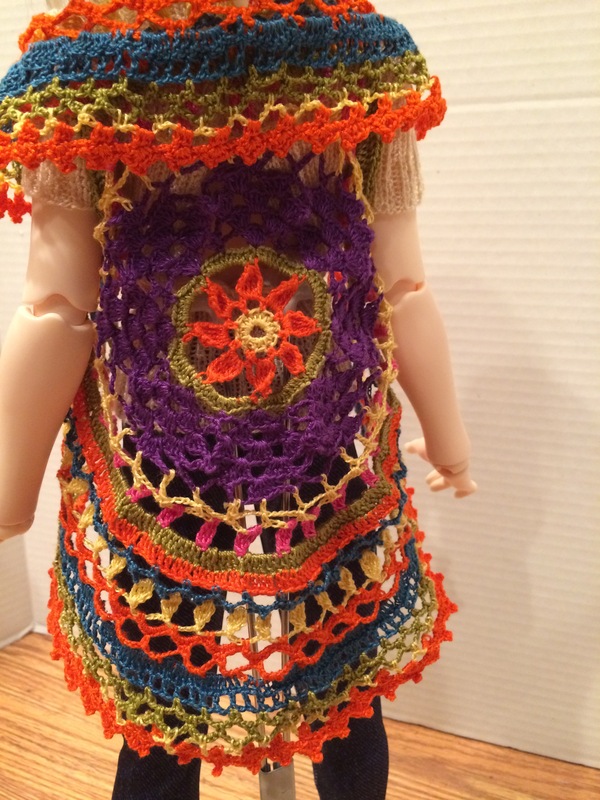 Her sweater was knit by me a year ago or more, based on a pattern by Cynthia Berrier. I could have sworn I knit this in a small (MSD) size, but it seems to fit Phoebe as if I knit it specially for her (Yes, it is a 3/4 sleeve). 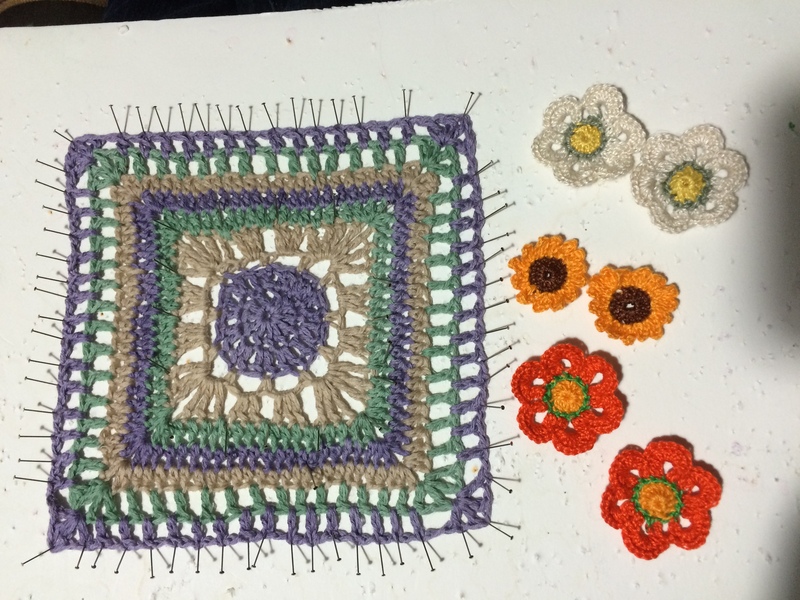 You can’t see it really well, but there are some flowers in the fabric in the same color as the sweater. 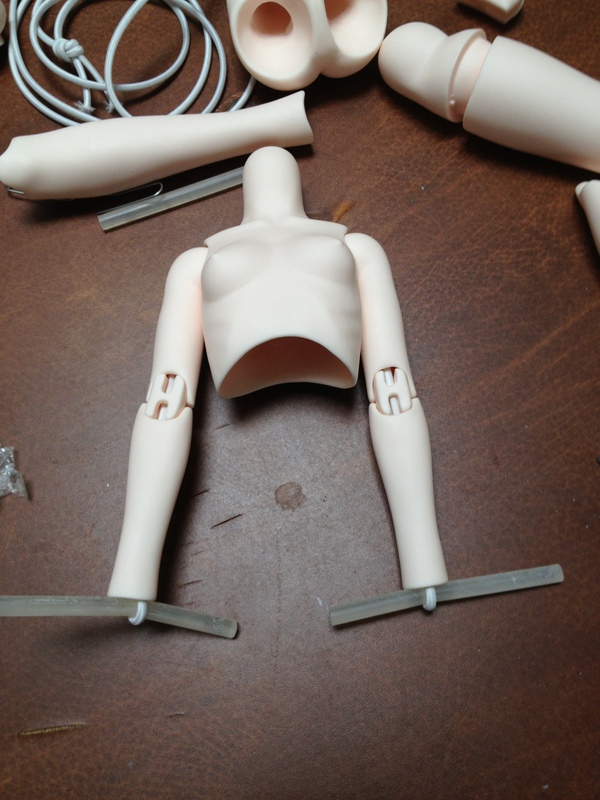 One day, in the not-too-distant past, I felt adventurous and purchased an unassembled SD size BJD body, specifically a Doll-In-Mind Love body, 57 cm tall. In english, that’s almost 22.5 inches tall. 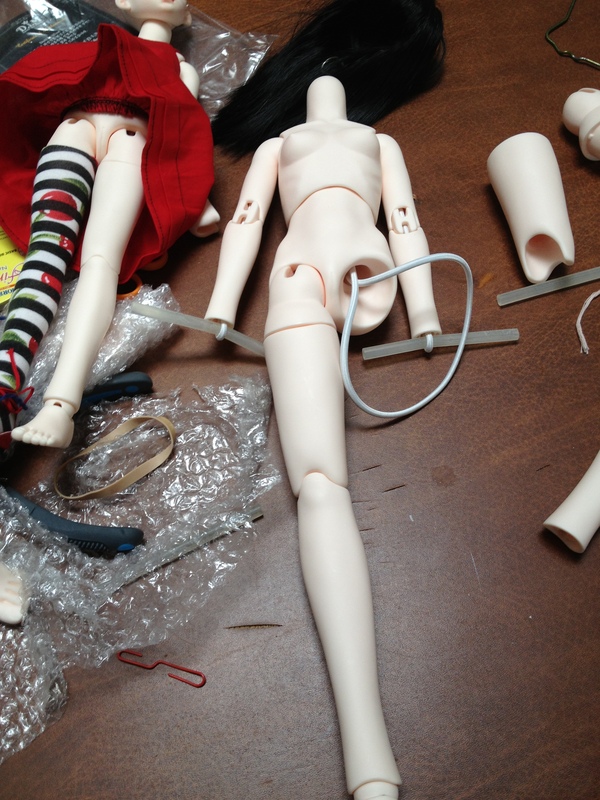 The following post is the story of Monica Frankenstein and the body she created from pieces. Step 1. Did a little research. In this case, I looked at some pictures online in my favorite forums. Step 2. Got all the body pieces, and my version of assembling “tools”. Step 2. Start with the arms. Got the arms on. Whew! That took strength and assistance from the Daughter. Oh no! Do elbows bend that way? I even bent my own elbow to make sure. (More research.) Dang! Wrong way. Step 3. This looks better. Attempt 2 successful! Thank you, Strong Daughter. Step 4. Two arms, one leg. So far, so good. Step 5. With the help of Strong Daughter, two legs and two feet later…. 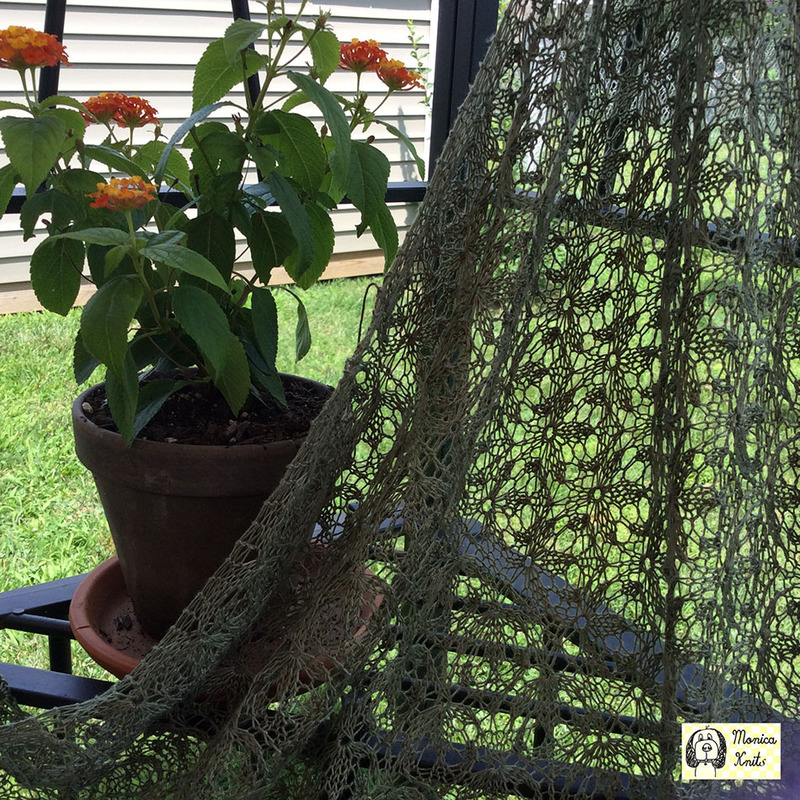 For the heck of it, I started knitting a lace edging in a leaf design. It’s the cuff part of a pattern for gloves. Then I got inspired to turn it into a skirt for my BJD. Here it is on my DIM Miru. It looks better in person. Really. 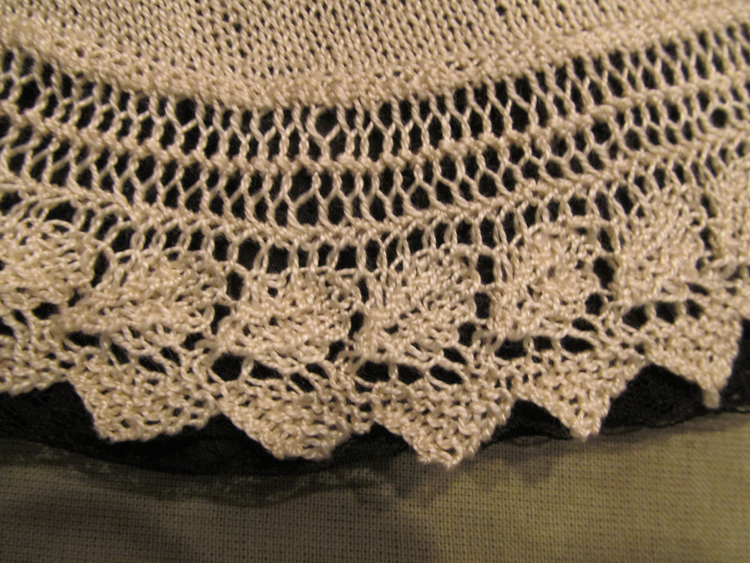 Close-up of the Lace bottom. 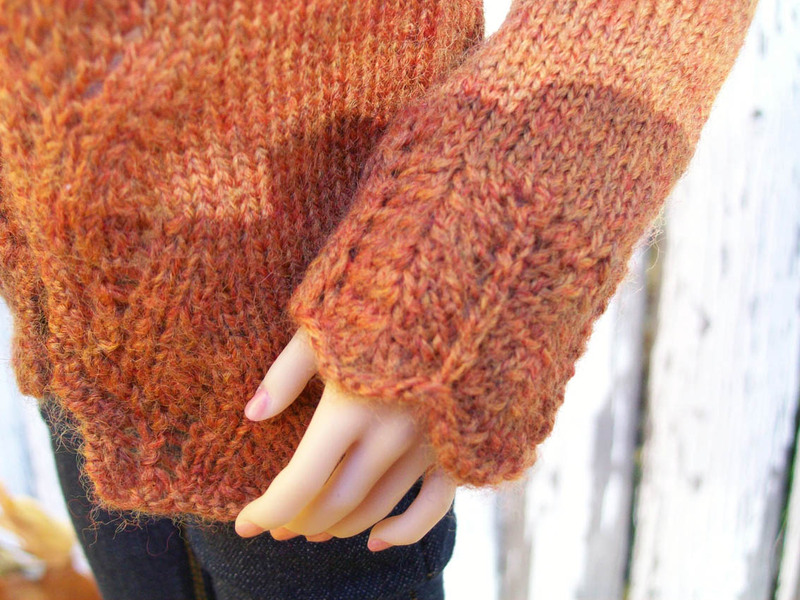 This cute little short-sleeved sweater is based on another pattern by DollsWest Designs, called Summer Tease. 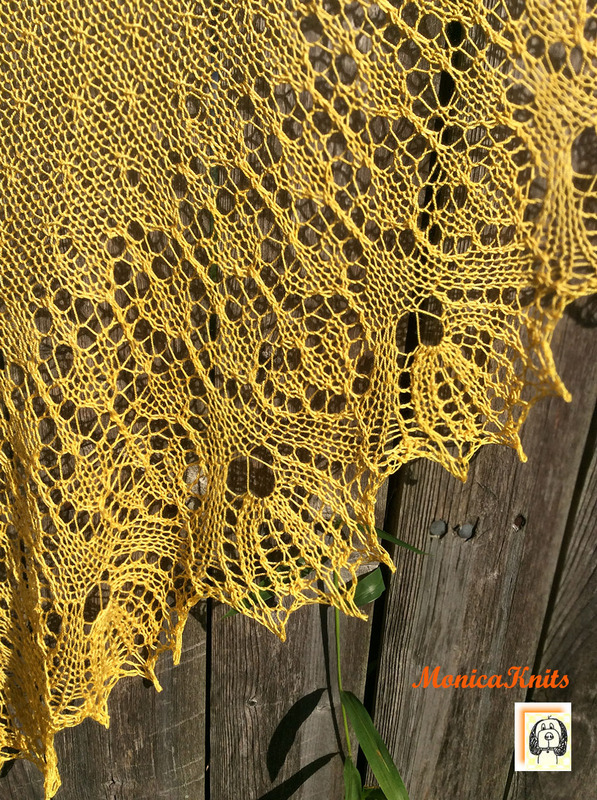 It’s easy to knit, even with the cable stitches. But I also wanted a simple t-shirt, so I just did the ribbing all the way through on this one. 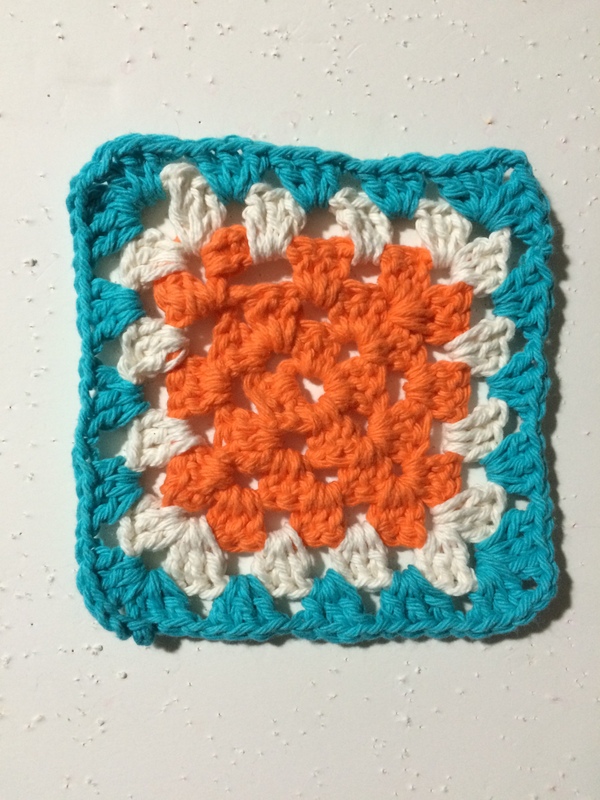 I used Perl Cotton. The cute little “tee” works great under other sweaters, with jeans, skirts, you name it. 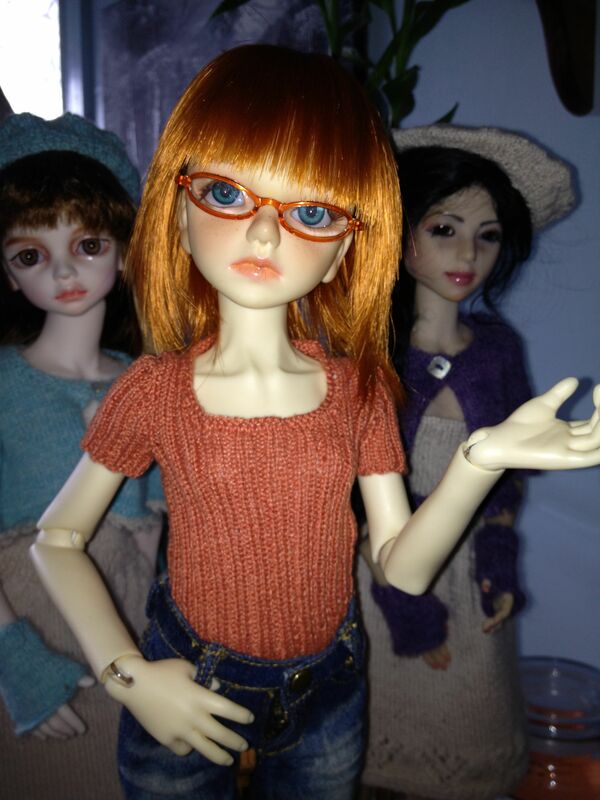 It fits a wide variety of MSD BJDs. 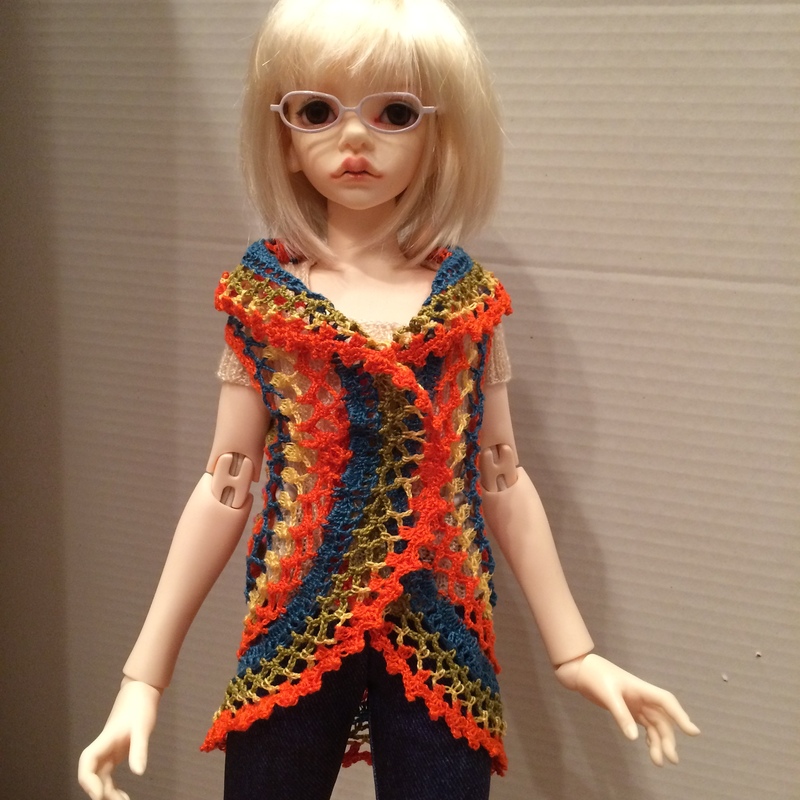 My Planetdoll Tara [43 cm] is wearing this t-shirt with her favorite jeans, and is tickled that it goes with her orange hair and glasses. 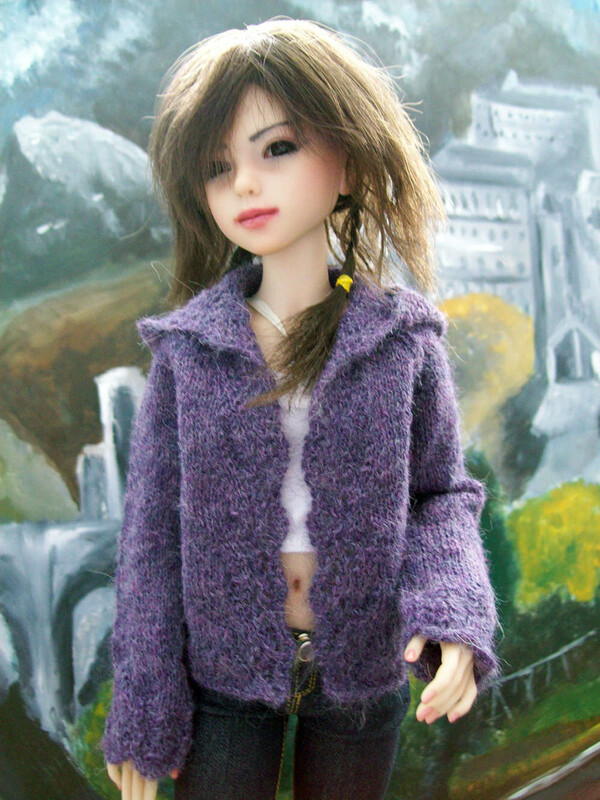 This is a 43 cm Narae Asian BJD, sculpted by Bimong. 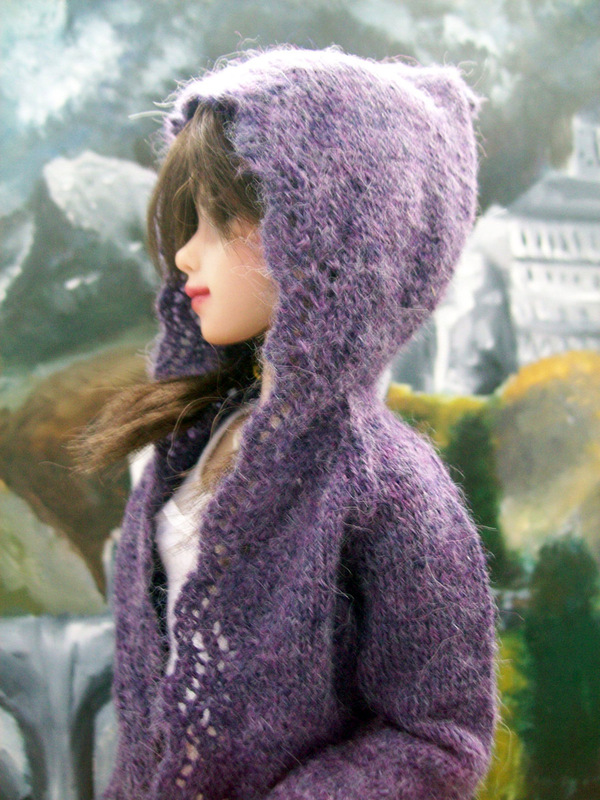 She is wearing a Lace Hoody I knit based on a pattern by DollsWest Designs. 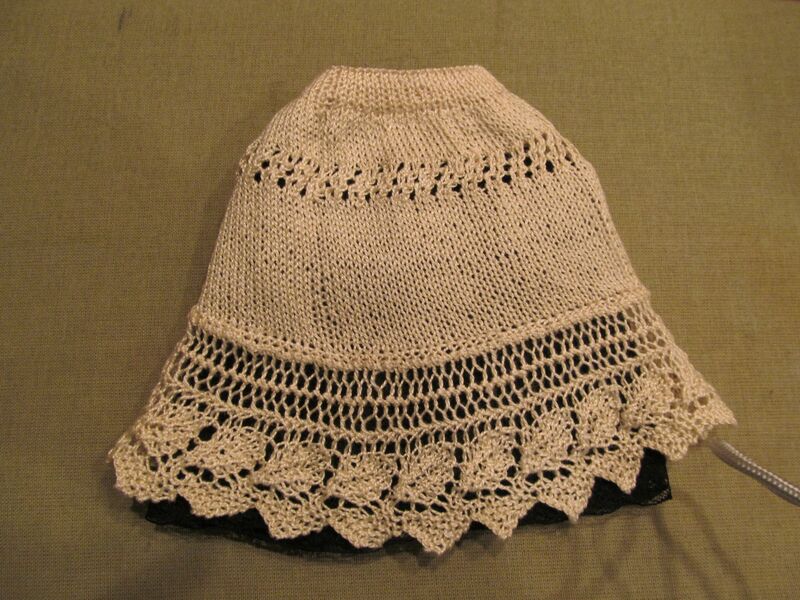 It was knit using baby alpaca wool – lace weight. 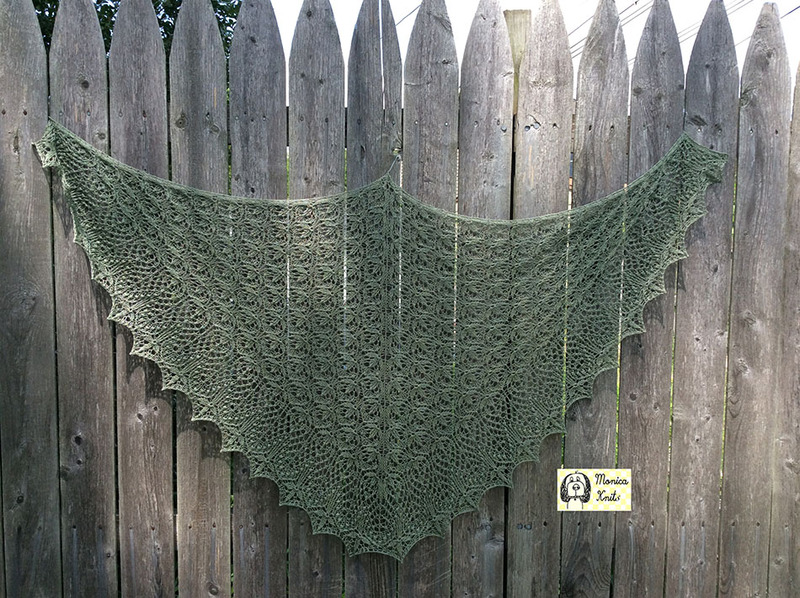 it’s great pattern and after the first time, it’s pretty easy to knit up. 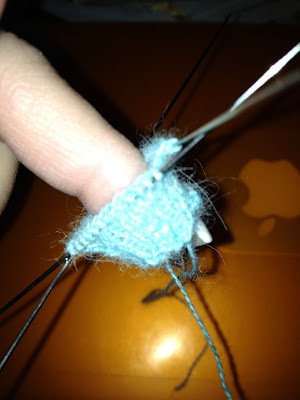 Fingerless Mittens – Dang They’re Tiny! 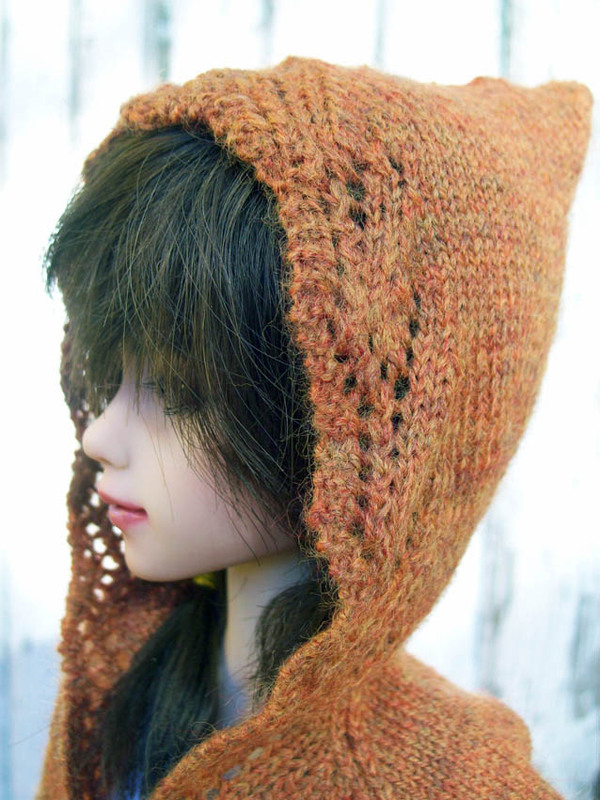 I’m working on a outfit for my BJDs – mostly knitted pieces. 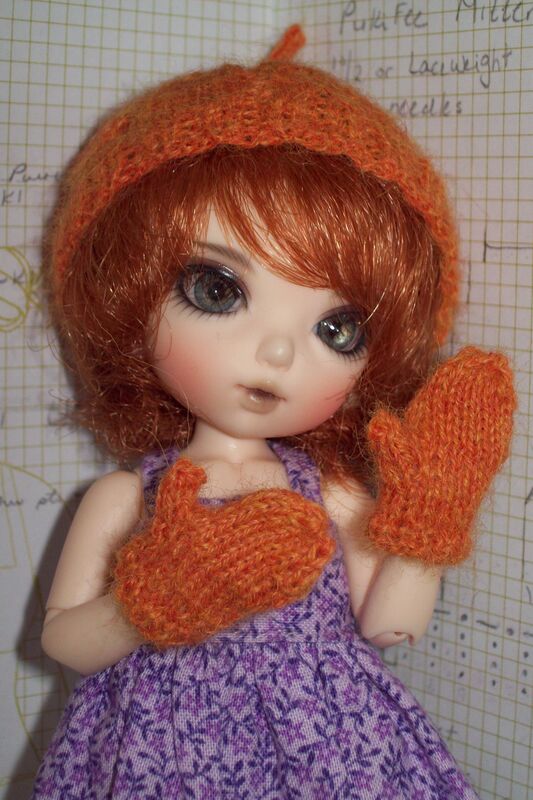 I decided to try some fingerless mittens/ gloves to add as accessories. We’re talking tiny hands here, but not the tiniest mittens I’ve ever knit. 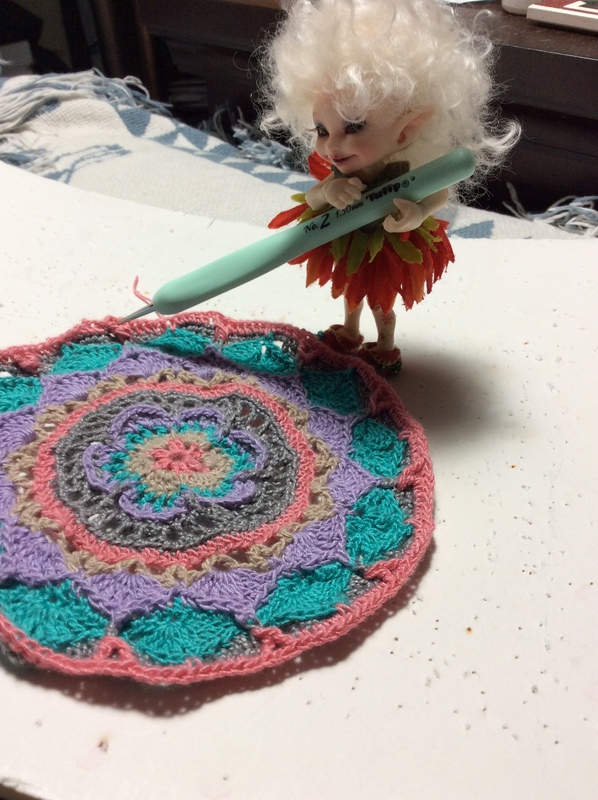 Tiniest on 4 needles though. 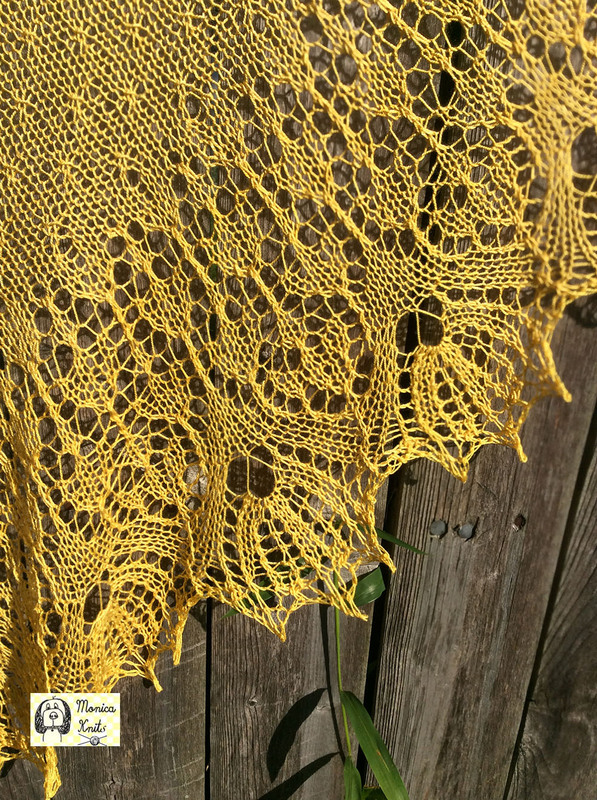 This is only the cuff – 8 rows of k2 p2 ribbing, using lace weight yarn and US size needles 5.5/0 – that’s .90 mm. 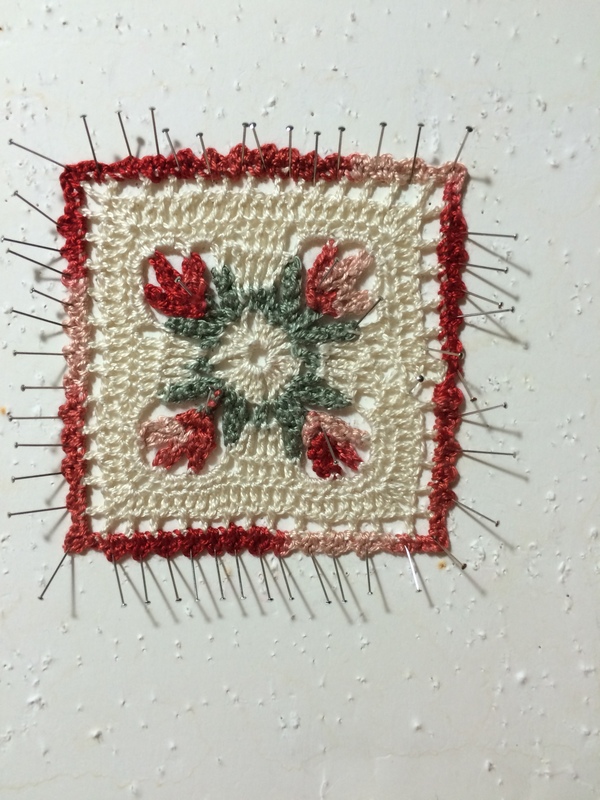 Like knitting with straight pins. Now comes the thumb – half of it anyway. 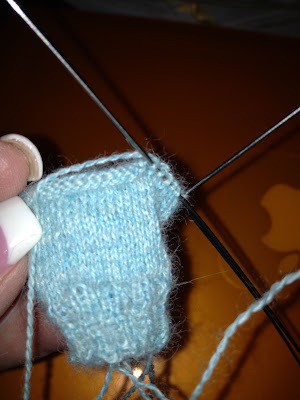 Still using 5.5/0 needles and 12 stitches, I knit 4 rows to make the half thumb. This was harder than the hand part of the mitten, obviously. Try manipulating 4 slippery needles with 2 fingers, cause that’s all you have room for. This the finished mitt. Still need to decide on how to embellish them. 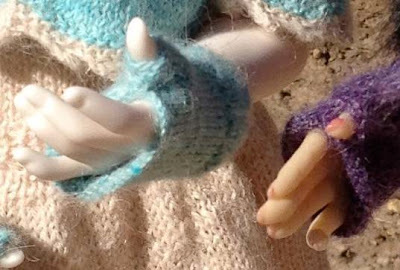 These tiny little mittens were made to fit a BJD 15.5 cm (6.10 inches) tall. You can imagine how tiny their hands are.